It’s now been more than 50 years since Doctor Who first hit our screens, the day after President Kennedy was assassinated in 1963. This makes it the longest running science fiction series that I know about, even though it was off the air from late 1989 until its return with Chris Eccleston in 2005 (bar the rather abysmal Paul McGann TV film in 1996). This longevity means that there is an awful lot of TV episodes and a massive amount of lore behind this series and it would take some dedication to watch all of it, meaning that unless you are a devoted fan then there’s an awful lot about this character and his adventures in time and space that you probably don’t know. 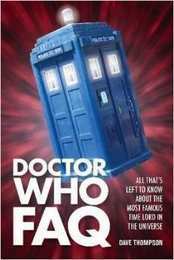 So presumably Dave Thompson, the author of over 100 books, thought it would be a great idea to write about the mysterious Time Lord as an addition to the FAQ series of books available from publisher Applause Theatre and Cinema. FAQ clearly stands for the now almost anachronistic computing acronym Frequently Asked Questions, and the approach here is that each chapter heading is a question that Thompson seems to think needs answering. Thompson is clearly an early viewer of the Doctor, recalling the very first episode, so that puts him at least in his early 50’s. He’s also quite knowledgeable about the early stories and actors. This book is also clearly aimed at an American audience with the publicity blurb in the PR sheet and on the back cover mentioning that Doctor Who is the most watched series in the history of BBC America. This being the case, I have to wonder what exactly the point of this book then is. Here’s the problem. Thompson is clearly an opinionated writer. He clearly loves all the early Doctor series all the way up to Tom Baker’s fourth Doctor. So far so good, you might think. Not so, as he then virtually dismisses everything after Baker with very little thought. Not such a good book for those who are still watching Doctor Who after it’s reincarnation in 2005, arguably even bigger than it was in the 80’s at least, if not prior to that. So who exactly does Thompson think will buy this book only to have almost 30 years of the TV series dismissed nonchalantly? I have to admit that I was biased from the moment that I read his first rather dismissive words about Peter Davison, who I identify as my Doctor even though I first started watching the series during Tom Baker’s reign. That was bad enough, but I’ve loved the new series since it came back, not to super geek proportions though obviously, and Thompson is incredibly dismissive of all of it, even though David Tennant and Matt Smith have arguably been the best Doctors since Tom Baker (yes, even better than Peter Davison). And he doesn’t have a good word about any of the recent assistants either, clearly loathing The Ponds in particular. So I’m left with the impression that Thompson is either an old curmudgeon stuck in his childhood with this series or hasn’t actually watched it at all since the return. So, with everything from 1982 virtually dismissed as useless and the likes of Stephen Moffat’s contributions glossed over (and I can’t even recall a mention of Russell T Davies, although he must have been as his name is in the index), all I can see as an attraction for those interested in all the adventures of the Doctor are the lists of episodes, audio adventures and books that make up the appendices. But we’re now in the internet age and those things are very easy to track down via any decent search engine. Ultimately then, even though Thompson’s style is an easy one to read, I just cannot recommend a book that is supposedly the definitive last word on one of the most popular TV science fiction series ever that casually dismisses more than half of its history. "(bar the rather abysmal Paul McGann TV film in 1996)". Have to agree with that one and would go further to say that that he should be classed as a Film doctor like Peter Cushing who did two Dalek films, and not in the line up of TV doctors (although officially he is, Grrrh!). I also saw the first B&W episode though it was a few months later that the UK, when it was broadcast in Australia. But Australians did the first taping of the series as we got the first Japanese VHS recorders, and quite a few lost shows have been 'sold back after arguments over copywrite' to the BBC, who were silly billies destroying their own copies.